New Years Eve in London is an amazing experience, considered one of the best places to be in the world to be and is topped off with a magnificent Firework display. 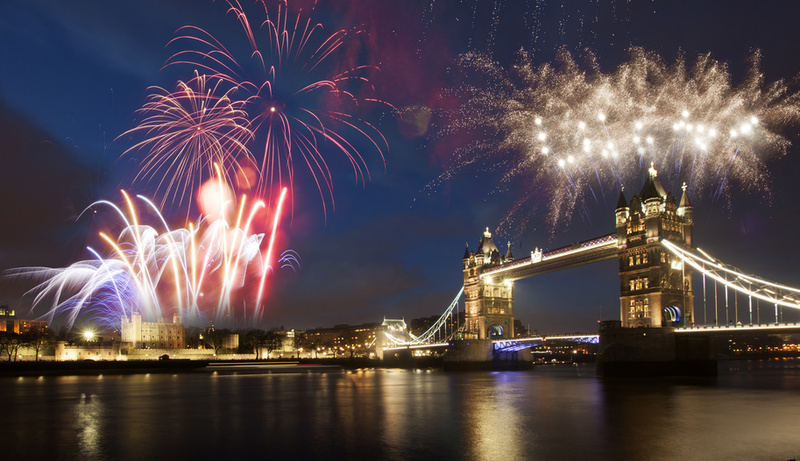 We are often asked how is the best way to spend the evening and see the fireworks and the answer is to join the party on board one of the Thames River cruises, with 4-course gala dinner, that approaching midnight moor up at a perfect spot to see the fireworks and receive complimentary champagne. For example here is a great New Year’s Eve Gala Dinner Cruise with City Cruises. Celebrate the arrival of 2016 in style with a gala sit-down dinner and dance cruise aboard a modern Millennium River-liner. You will be welcomed aboard with a drinks reception. You will be shown to your reserved table where your dinner will be served. Tranquilly cruise through central London. After a delectable dinner, you can dance the night away and, at midnight; toast the arrival of 2016 with a glass of champagne whilst listening to Big Ben ringing in the New Year. Posted on September 4, 2015, in Uncategorized and tagged Fireworks, London Eye, London Tours, New Years Eve. Bookmark the permalink. Leave a comment.